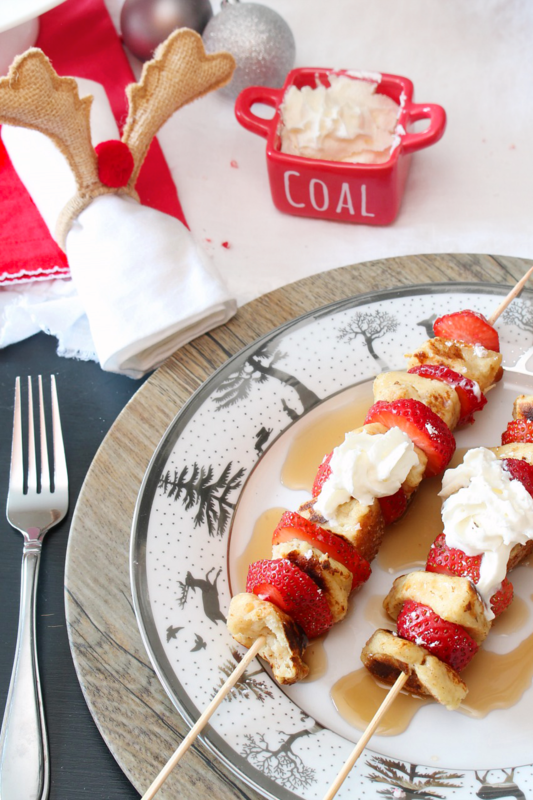 These Candy Cane French toast kabobs are quick and easy to whip up and would make a fun and delicious Christmas breakfast idea for Christmas Eve or Christmas Day. 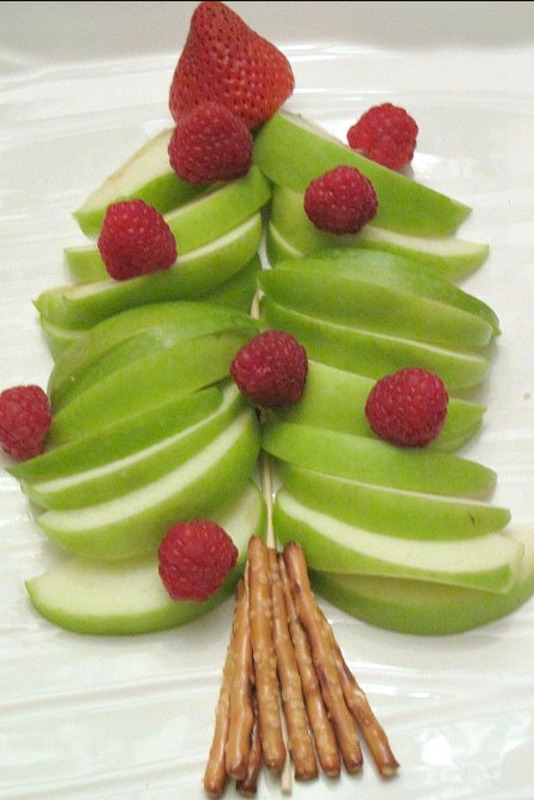 With two weeks to go until Christmas, it’s time to start planning out those Christmas menus! 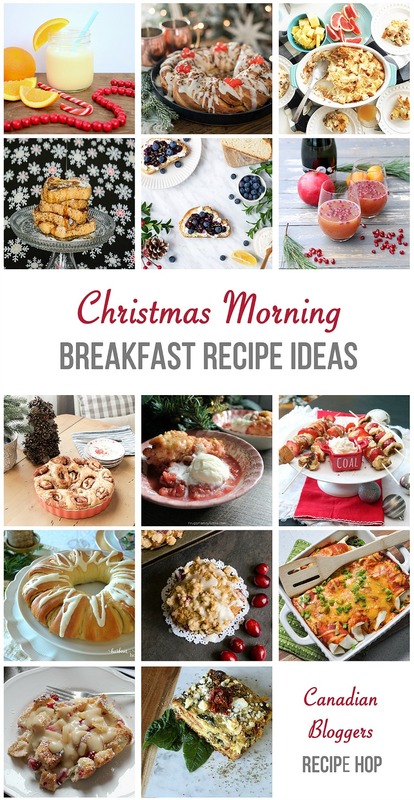 Today I’m joining Jo-Anna from A Pretty Life and some of my favorite foodies, to share our favorite Christmas breakfast ideas with you. 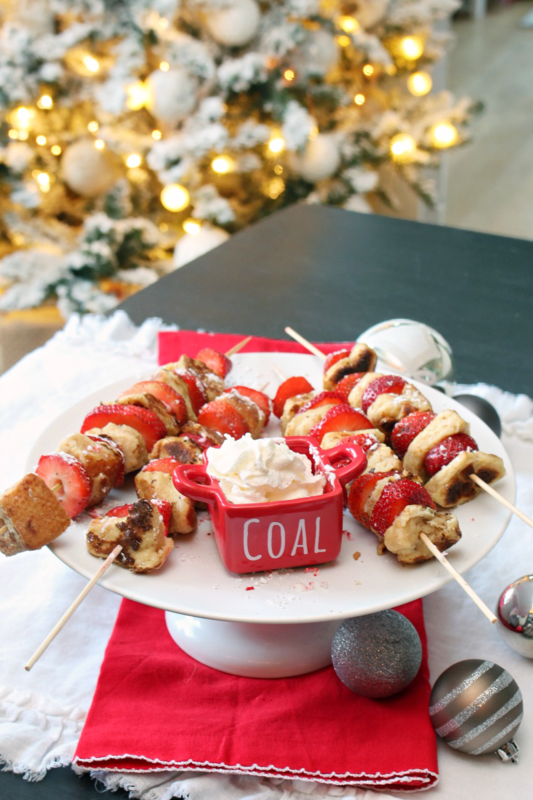 I made up some of these candy cane French toast kabobs and have a few ideas from our previous years’ Christmas Eve breakfasts as well. Ever since I can remember, we have always had cinnamon buns and a wife saver casserole for breakfast on Christmas Day. I don’t know why I never make it any other time of the year, but it’s just one of those things that I save especially for Christmas. Once our kids were born, however, Dave and I wanted to start a few new Christmas traditions of our own. Since Christmas morning is always with our extended family, we decided to do a Christmas Eve breakfast every year with just our own little family. We have something different every year, but I always try to do something fun for the kids. 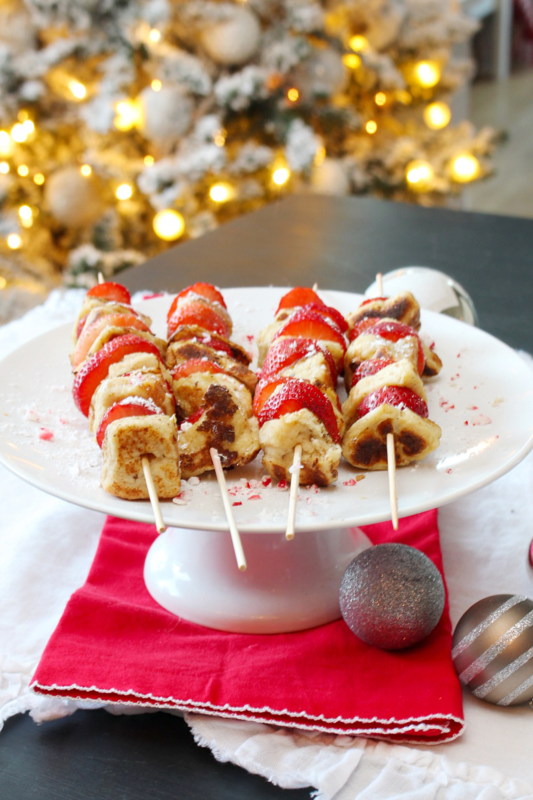 We always seem to have pancakes of some sort and a fruit snack, so I thought that I’d try something a little different this year – candy cane French toast kabobs. 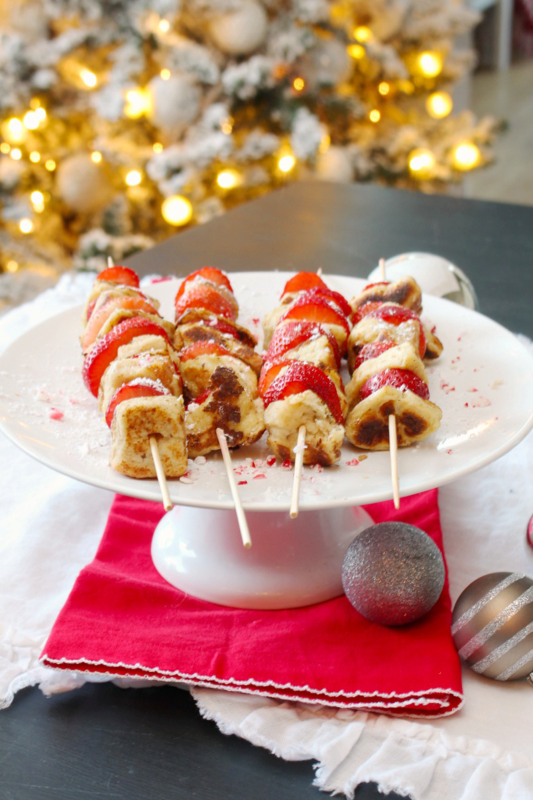 These candy cane French toast kabobs are quick and easy to whip up and make a fun Christmas Eve or Christmas Day breakfast idea! Warm oven to 150 degrees. Cut the bread approximately into 1 inch x 1 inch cubes. You can trim off the crusts beforehand if you choose, but I left mine on. In a mixing bowl, beat the eggs, milk, vanilla, and cinnamon.Add 2 cups of the bread cubes and mix until saturated. Butter a nonstick 12-inch frying pan and place over medium to high heat.Gently lift the bread from the mixture and shake off any excess liquid. Add the bread mixture ot the pan and cook for approximately 5-6 minutes, turning as needed. Place in oven to keep warm. Repeat the above steps with all the remaining bread cubes. Alternate adding a French toast cube with the strawberry slices to a skewer. Sprinkle with icing sugar and crushed candy canes if desired. Top with syrup and whipping cream to taste or place syrup and whipping cream in a bowl to dip them. We sprinkled ours with a little bit of crushed candy canes, and I really liked the light peppermint flavor. If it’s not your thing, you can always leave this out of course, or look for strawberry-flavored candy canes instead. And you can’t forget the syrup and whipped cream! They’re pretty fun to eat! 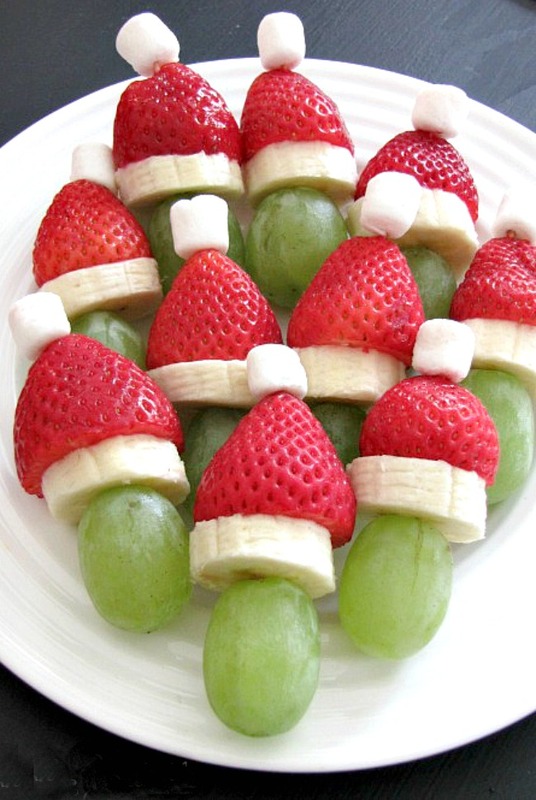 We paired ours with some easy Grinch fruit snacks with the left over strawberries. 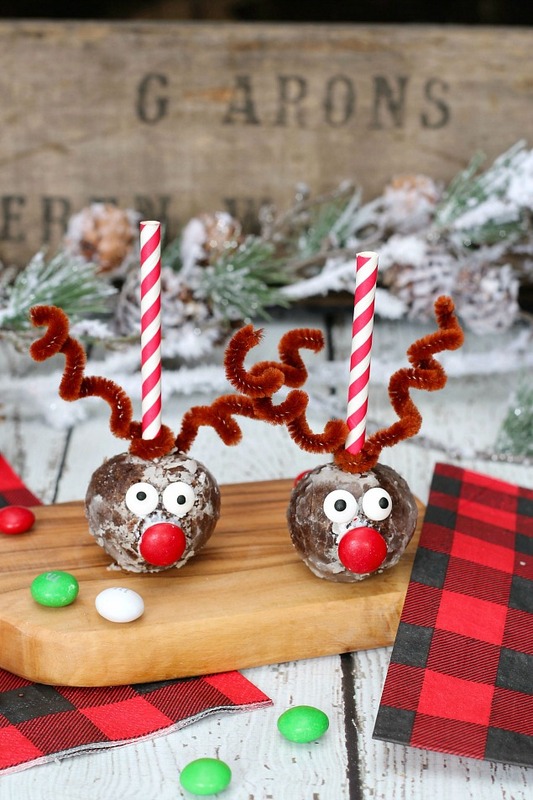 And, if you still want a little sweet treat, these cute reindeer donut holes can be made in just a couple of minutes and prepared the night before. 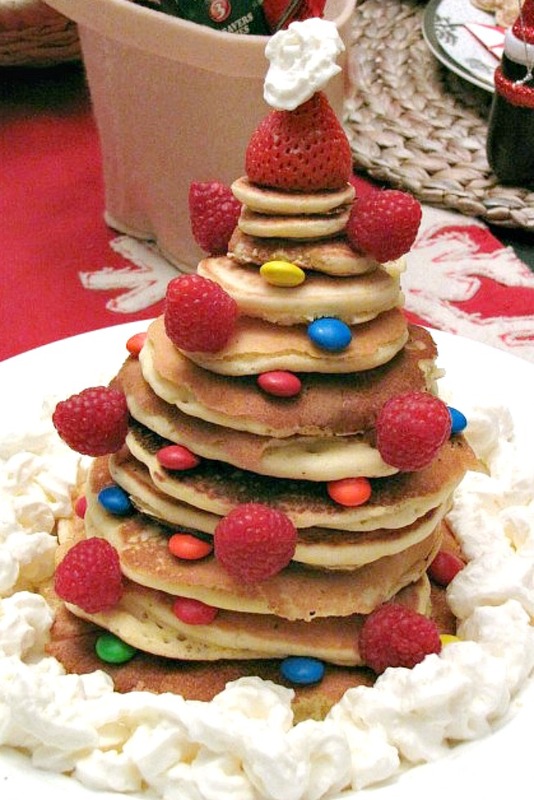 I hope you have a fun Christmas breakfast, whatever you choose to do! 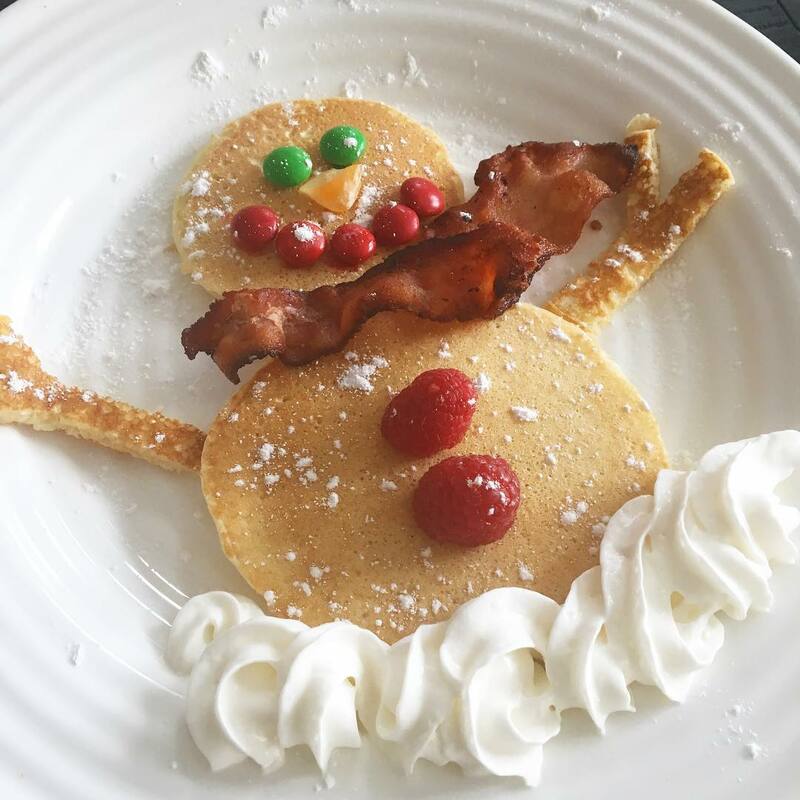 Before you head out, be sure to check out all these other simple and delicious Christmas breakfast recipe ideas. There’s something for everyone and they all look amazing! 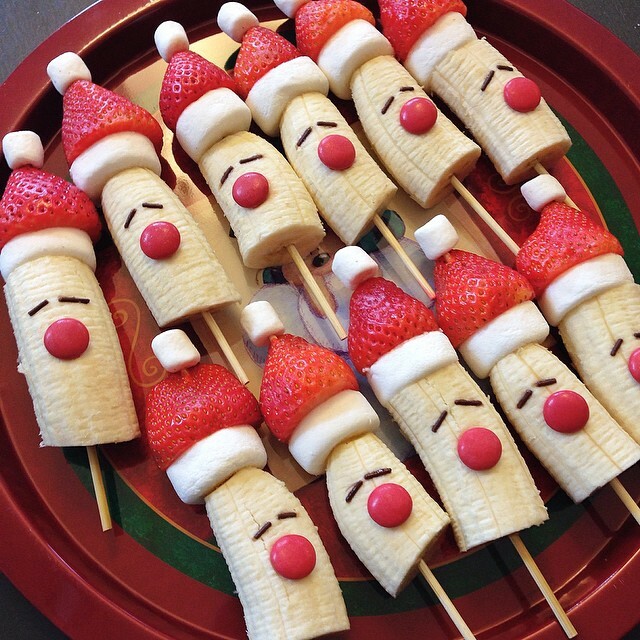 Maybe I should just skip Christmas dinner and stick with Christmas breakfast ideas! 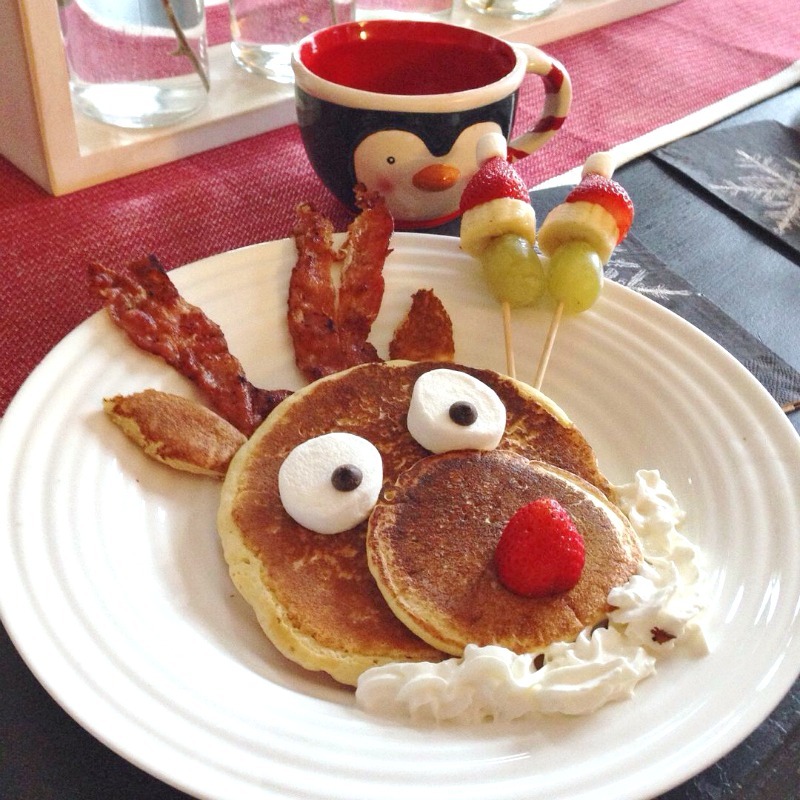 Wow, I love all of the really cute Christmas morning breakfast ideas that you have! My kids would go crazy if I could pull even just one of these off! Oh and I love your little “coal” dish! So cute! Thanks so much Sarah! I just got the dish so I was happy to use it! Mine are 10 and 14 and STILL messy!! These all look absolutely amazing, Jenn! 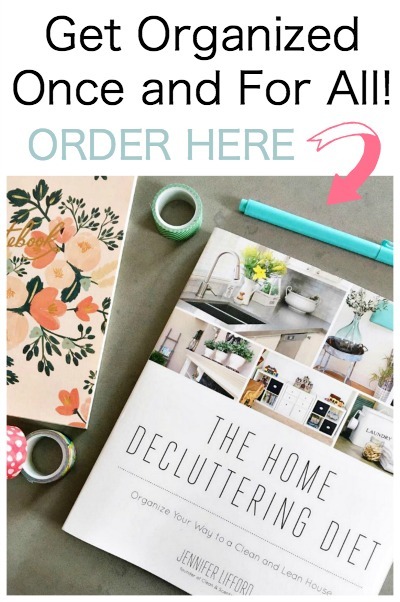 So many fun ideas- perfect for the kids! You are a fun mom! 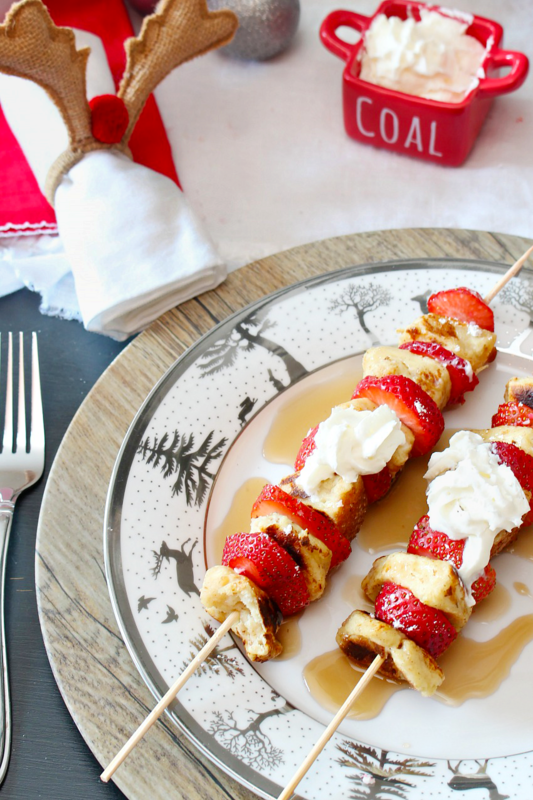 So many cute breakfast ideas- and the french toast kabobs look delicious. Thanks so much! They definitely don’t get breakfast like this on a regular basis! lol!